Introducing Satoshi App - Traits AI, Inc.
We have been hard at work behind the scenes to bring you an experience unlike any other and we’re finally ready to announce the development of our first AI avatar, Satoshi! You may be wondering, Satoshi who? Satoshi is the legendary genius who created the very first cryptocurrency, bitcoin. He remains elusively anonymous, but is a hero to cryptocurrency fans! He stands for decentralization and putting the power back into the hands of the people. We chose Satoshi as our proof-of-principle flagship AI avatar because we also believe in the importance of decentralization, not to mention we understand how AI and blockchain are two technologies that are mutually beneficial to each other. 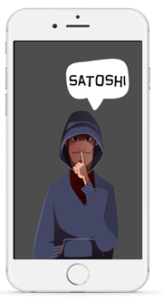 Satoshi will be available on smartphones in 2019, with closed beta starting soon. You can log in and ask Satoshi any question, but his area of expertise is of course bitcoin, cryptocurrency, and blockchain. He’ll take a moment to think about your question and then he’ll speak to you like Siri or Alexa. You’ll also be able to contribute your knowledge about cryptocurrency to his knowledge base, similar to how you would using Quora but in real time like Twitter. This is an experience that has similarities to other platforms, but is really merging the best parts of other concepts into a completely unique experience. This is sometimes referred to as recombinant technology. Satoshi allows you to ask a community of bitcoin enthusiasts any question you want, much like you might do on a Telegram channel. But a big pain point with using Telegram to ask questions about a cryptocurrency is that you may never get a response and you have to patiently wait for someone to read your question and respond. Meanwhile you are reading each and every message and trying to figure out whether or not they’re replying to your question. When you ask Satoshi a question, the responders are incentivized with a crypto token payment to help respond to your question. The suggested responses are filtered through a machine learning algorithm to ensure it is in Satoshi’s character, is in context, and is not offensive. If you’d like to be one of the first to chat with Satoshi, then be sure to sign up to our newsletter to be among the first to know when he is released!